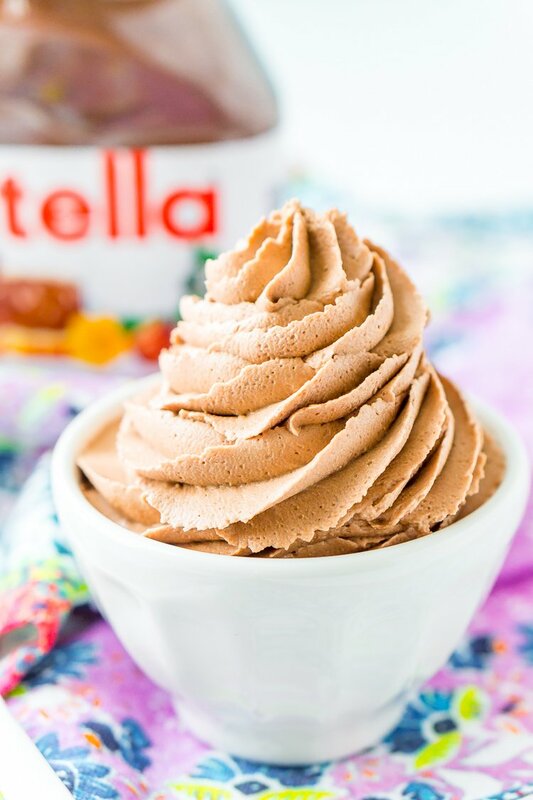 Nutella Frosting adds chocolate and hazelnut flavors to a traditional buttercream recipe. Made with Nutella, butter, powdered sugar, and heavy cream, this whipped Hazelnut Frosting is totally addictive! Are you a fan of Nutella? Then you’re going to go absolutely crazy for this light and fluffy Nutella Frosting! Hazelnut is one of those flavors that happens to pair perfectly with chocolate, so it’s no wonder that people who enjoy the sweet spread don’t just like it—they’re obsessed! TAKE ME TO THE NUTELLA FROSTING RECIPE ALREADY! 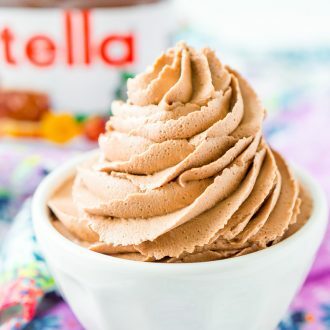 If you’d rather skip my (very helpful, I think) tips and tricks, essential cooking info, and similar recipe ideas – and get straight to this deliciously easy Best Ever NUTELLA FROSTING Recipe – simply scroll to the bottom of the page where you can find the printable recipe card. If you’re one of those people who puts Nutella on just about everything, this creamy frosting may be your next addiction. 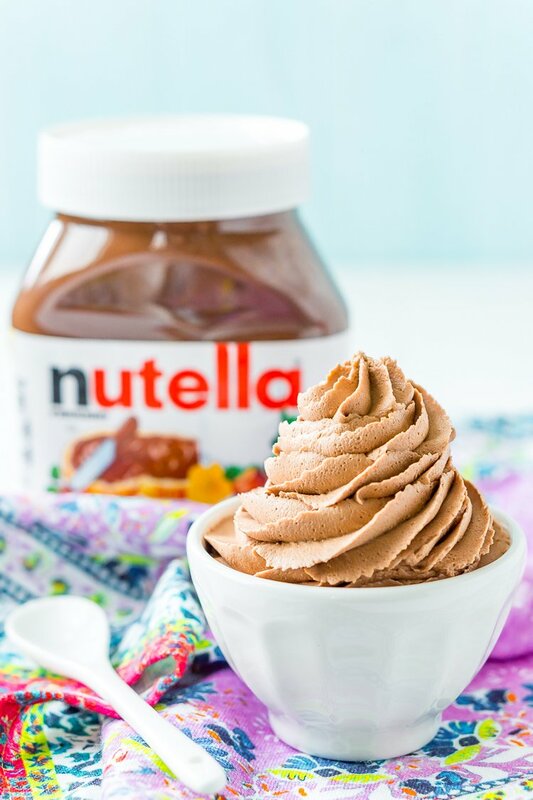 With just four ingredients, you can whip up a batch of Nutella Buttercream to add to cakes, cupcakes, and even cookies. Of course, you can always just eat it by the spoonful! To make Hazelnut Frosting, combine Nutella, butter (at room temperature), powdered sugar, and heavy cream, then blend together until smooth. Spoon into a pipette for decorating, or spread right on to your favorite baked goods! My Favorite Piping Tip!Buy Now! 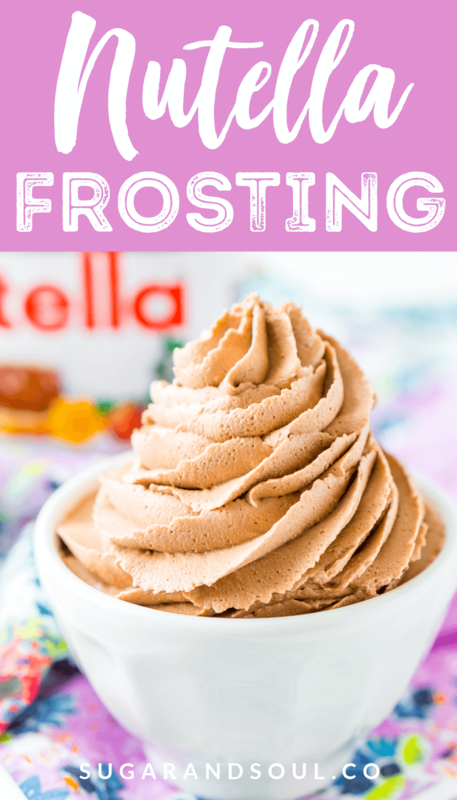 Buttercream frostings are my favorite, and I love this Nutella Frosting recipe because it puts a twist on traditional versions. The combination of chocolate and hazelnut adds depth and enhance the flavors of different types of cakes. In other words, it’s a simple way to give your basic cake or cupcake recipe an upgrade! In my opinion, Nutella Buttercream tastes best on chocolate or dark chocolate cakes, but it also adds an exciting flavor to classic vanilla. Plus, it’s to die for on chocolate espresso cakes or cupcakes, and you can wash it all down with a hot mug of coffee… hazelnut, perhaps? If you’re headed to a party or potluck, making a treat with Hazelnut Frosting is an easy way to impress guests. 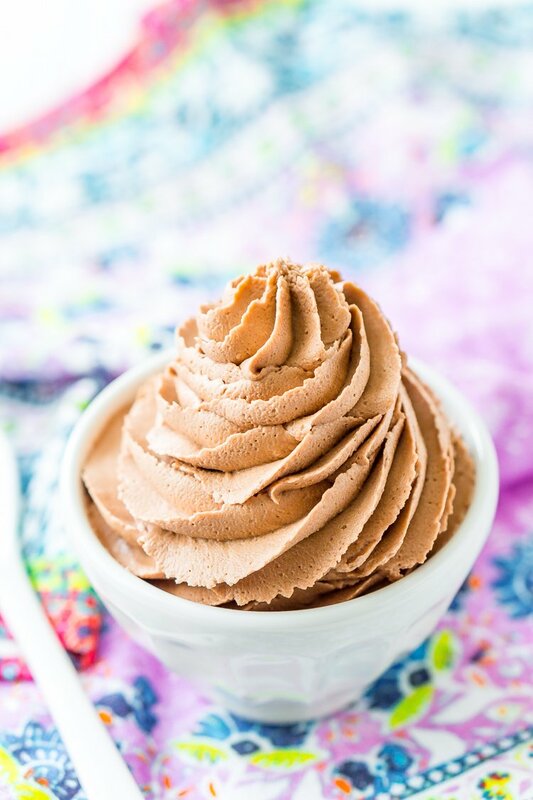 While most people have tried the chocolatey spread, not many have had it in frosting form before! 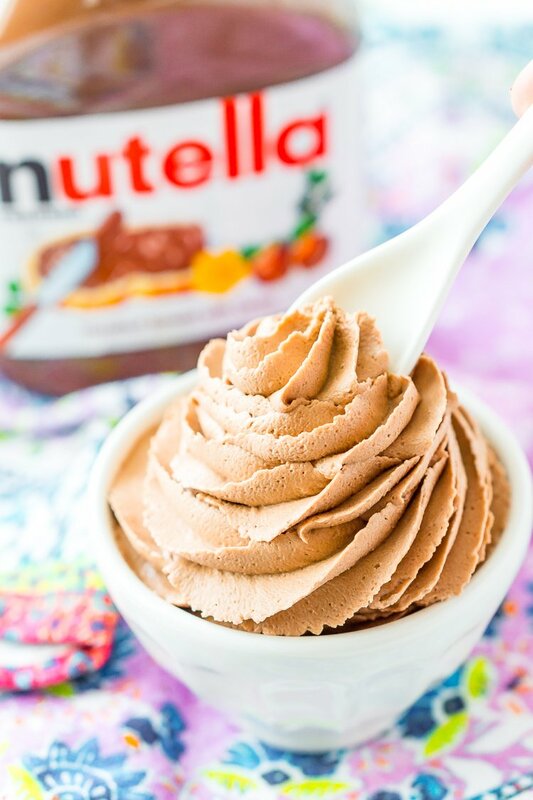 Nutella Frosting is an addictive recipe that adds a rich dose of flavor to your traditional baked treats. Try it on your favorite cake and cupcake recipe for a crowd-pleasing dessert that everyone will love! How Do You Make Nutella Frosting? 1. Mixing – I find it best to make this frosting in a stand mixer with a whisk or paddle attachment, the high power can whip this recipe into the fluffy gloriousness that makes it so great. In a pinch, a hand mixer will do just fine, but will not achieve as fluffy a frosting! 2. Vanilla – I generally prefer to add my vanilla or extract to frostings in the beginning when I’m creaming the butter, this means it’s there throughout the entire mixing process and melds with all of the other ingredients. 3. Creaming – The butter and Nutella gets creamed together first to make sure that they are completely combined before adding any other ingredients. 4. Sugar – When it comes to any buttercream, you want to add the sugar in batches, this allows the sugar to mix more thoroughly and usually prevents it from flying all over the kitchen. You may want to add a little more sugar than the recipe calls for depending on how thick you want your frosting. 5. Liquid – It’s important to add liquid in small doses for a couple of reasons. One, it can splash everywhere if you add too much at once. Two, the liquid can impact the texture of a frosting really fast. I like to add heavy cream to this recipe a tablespoon at a time until I reach the desired consistency. 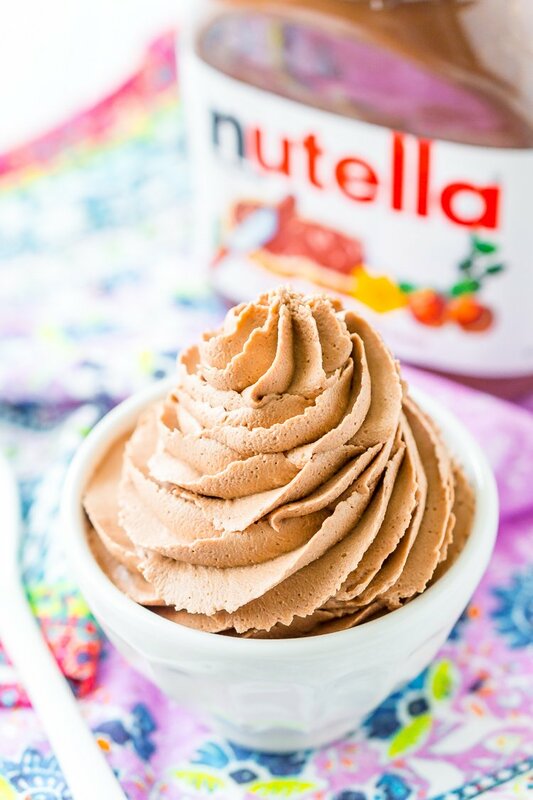 Pin This Nutella Frosting Recipe for Later! Cream the butter, Nutella, and vanilla together using a paddle attachment until thoroughly mixed. Add powdered sugar a cup at a time, alternating with heavy cream. Whip on medium-high speed for 2-3 minutes until frosting is light and fluffy. Add additional cream or confectioners sugar as needed to reach desired consistency. Frosting can be made with a hand mixer but will not be as whipped. This looks amazing, I know it will turn out delicious just by looking at the ingredients. I have a question though, because of the heavy cream in it, does the baked cake or cupcakes after frosting will need to be kept in the fridge? Do I also keep the frosting in the fridge if I whip it one day before the party? Thanks! Hi Gigi, you shouldn’t need to refrigerate them, although you can if you want to. The buttercream should hold up well and shouldn’t spoil as long is the place it is store isn’t much higher than 72 degrees F.
If you make it the day before the party, keep in mind that you will likely need to rewhip it for piping or frosting as it will “crust” like a buttercream and it’s easier to work with when smooth.